Derek Knight Does it Again! Club President Alan Pidcock, Super B winner Derek Knight, B Level winner Dennis Scarr, Tournament Manager John Haslam. They came from near and far – from the north east and the south west, from the east midlands and of course the north west, there were even four local players. 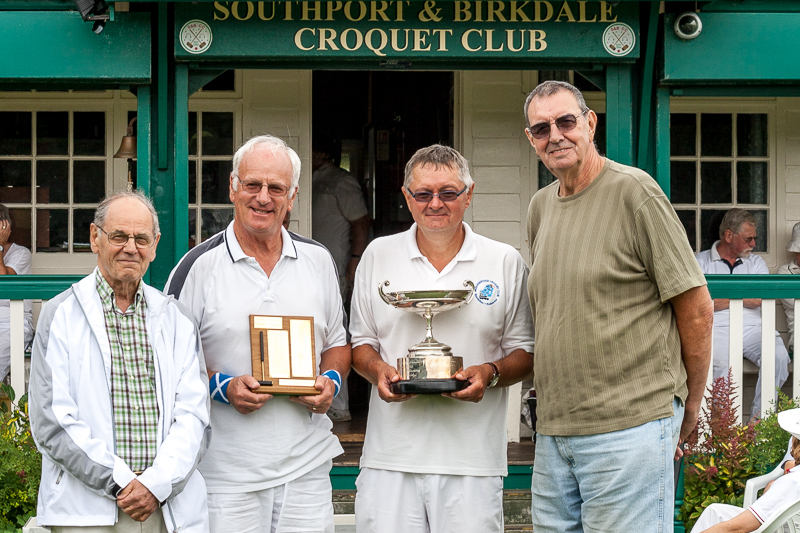 The unique double tournament was here again – the Southport Level B and the Southport Super B Advanced Croquet events. The Southport climate gave everyone a soaking on Saturday, then roasted everyone to a nice colour on Sunday. The recent very dry weather had made the lawns fast, which combined with some tight hoops made for a challenging competition. 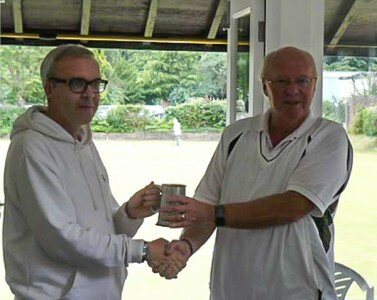 In the Super B event, Derek Knight (Beverley) showed great form throughout the weekend, playing skilful croquet, to remain undefeated, to take the Manor House trophy to add to his B Level win from last year. Peter Moore (Nottingham) took second prize, losing only one game in the Super B. In the B Level event, the leader board was changing after every round in a tightly contested format. Three players were still in contention in the final round with Don Williamson (Southport), Barbara Haslam (Southport) and Dennis Scarr (Middlesborough). Don and Dennis both winning their games to give the Manager a problem but since Dennis had beaten Don in the first round, the beautiful Hawkins Cup was presented to Dennis Scarr. A really enjoyable tournament with efficient management (and even refereeing) by John Haslam, plus of course the usual Southport excellent catering. * a final task was a jump/ drag shot to run rover whilst dragging through the “stuck” pelee. Twelve members turned up. This was a well run session and grateful thanks go to Matt. The Northerns took on a new format this year, being split into 2 three-day sections. The first 3 days (Saturday to Monday) were dedicted to Advanced/Level Play then Handicap Play followed from Tuesday to Thursday. 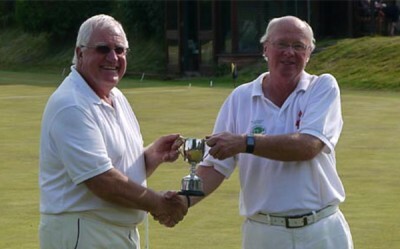 James Hawkins won the Advanced section whilst Brian Storey won the Handicap.